Synnemata of Ophiostoma ulmi, the causative organism of Dutch elm disease, from here. 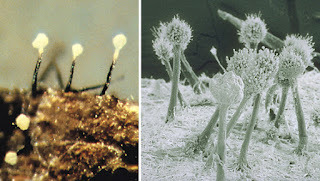 The Ophiostomatales are a group of fungi producing spores that are dispersed by associated insects; among the Ophiostomatales are many of the ambrosia fungi found in association with bark beetles. Characters (from von Arx & van der Walt): Thin dikaryotic hyphae with septa with simple pores; small, evanescent asci in perithecial ascomata that usually have long beaks through which the ascospores are extruded as a sticky, mucoid mass; small, pale ascospores without germ pores, dispersed by associated insects. [HWB03] Henk, D. A., A. Weir & M. Blackwell. 2003. Laboulbeniopsis termitarius, an ectoparasite of termites newly recognized as a member of the Laboulbeniomycetes. Mycologia 95 (4): 561-564.